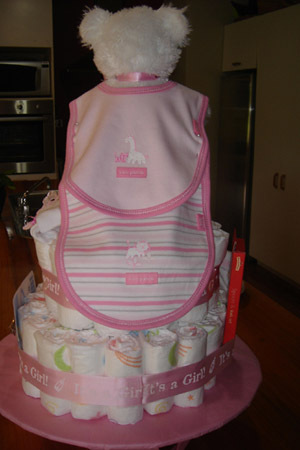 This creative bear diaper cake is cute AND cuddly! 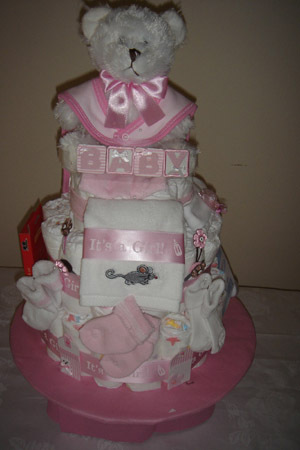 This diaper cake combines adorable toys and adornments with classy colors and ribbons. 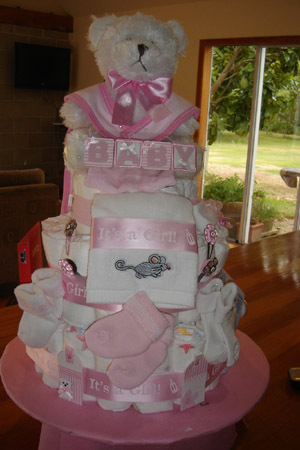 This creative diaper cake comes to us all the way from New Zealand!! Moira is a kind and helpful friend to all of us in need of diaper cake ideas. By sharing with us her wonderful ideas, she has made this website a better, more thorough resource for everyone. So thank you Moira!! It's a lovely cake! I saw ideas on your website, and wanted to show you what I did. 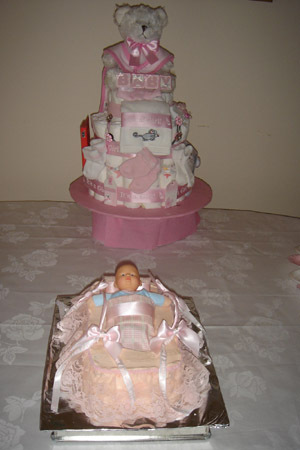 My friend loved it so much she hasn’t dismantled it, she has had the diaper cake for 6months. Thanks Moira!! I can see why your friend doesn't want to take it apart!